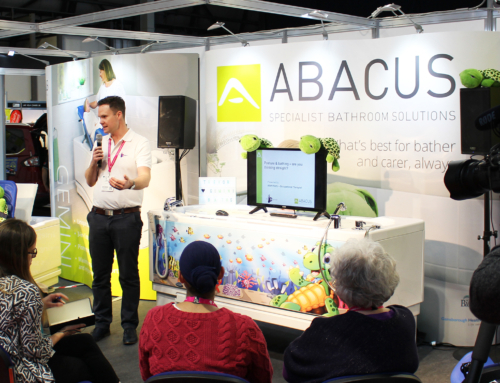 During Naidex National 2015, both Kate Sheehan’s seminar in association with Abacus Healthcare and its assisted bath showcase attracted significant interest from healthcare professionals. Abacus demonstrated three of its powered Aquanova baths including the Gemini, the Scorpio and the Aries. 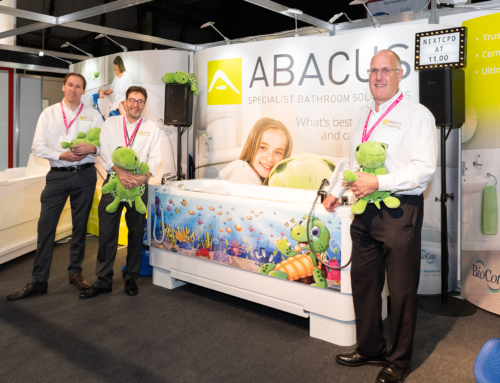 These specialist baths, along with the respected Abacus range of postural supports, help disabled children and adults enjoy accessible bathing. The height-adjustable Gemini is a popular choice for OTs looking to recommend an assisted bath that allows clients, families and carers to have a pleasurable and safe bathing experience. Its unique 3-in-1 variable-height changing, bathing and drying platform helps minimise back injuries for carers and ensures bathers remain comfortable as awkward transfers can be avoided. These benefits were demonstrated throughout the exhibition and further reiterated by experienced Occupational Therapist, Kate Sheehan, who presented at Naidex in association with Abacus. Kate’s seminar, entitled ‘Bathing – the right to play’, was delivered in the Multidisciplinary Theatre during the third day. Kate illustrated in a concise manner why ‘play’ during bath time is vital to developing the potential of a disabled child. Her presentation was engaging and prompted a thought-provoking ‘question and answer’ session that continued on the Abacus stand. The combined availability of Kate’s bathing expertise and the Abacus bath demonstrations at Naidex provided a unique opportunity for therapists. It allowed professionals to consider in more detail how legislation and clinical reasoning can be used to support the necessity of an assistive bath. Abacus Healthcare has been a leader in specialist care for over 25 years. This proven heritage was highlighted to Naidex visitors along with the complete service that Abacus provides, from initial assessment and bathroom design, through to bath provision, fitting and after-sales care. This package of support ensures adults and children with disabilities can bathe with more comfort, dignity and safety.